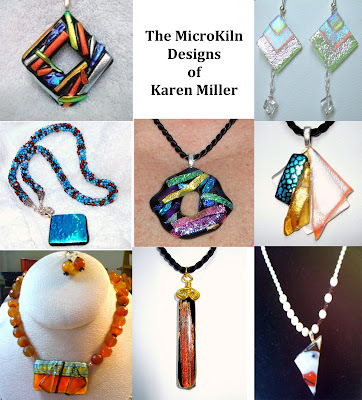 Karen Miller works as a registered nurse to support her artistic habits. Yes you heard me right, to support her artistic habits. She started years ago with pop beads and gum wrappers to creating jewelry. From there, she matured into macramé, sewing, polymer clay, wood and egg engraving and every other craft project out there. 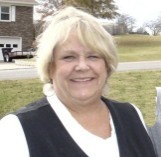 Ten years ago, after a major surgery, her daughters bought her a necklace kit to relieve the boredom of recovery. She loved it and then a more serious adventure began. Her friend, Donna Zimmer, turned her onto bead shows and that was the beginning of beautiful gemstones and Swarovski crystals entering her life. Then she met Dale Armstrong, who taught her wire wrapping, a perfect compliment to her beading. Karen states, "Sam" Roh and the MicroKiln have my interest. With the MicroKiln, I can now create a glass design with quick results, make changes and have a finished design in less than an hour. I really like dichroic glass ..... so sparkly. I use all the elements with techniques I have learned to design and create my jewelry pieces today. All submissions should be emailed to Mkhdblog@gmail.com by the 20th of each month. Looking forward to hearing from you and sharing your creations with the world.